In November 2017 Art Deco Trust is launching the Robert McGregor Heritage Fund. The purpose of this fund is to enable the Trust, in partnership with the Napier City Council to provide financial assistance to owners of heritage buildings and in doing so, continue to support the preservation and restoration of this critical element of the Napier story. The fund is named after Robert McGregor (1940-2015). Robert was a founding member of the Art Deco Trust, the Trust’s first President and its first Executive Director (from 1992, when the Trust became a professional organisation). 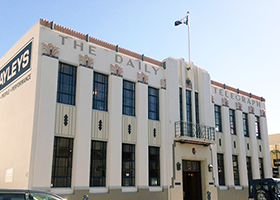 He was a passionate advocate of Napier, Hawke’s Bay and our unique art deco architecture and heritage. 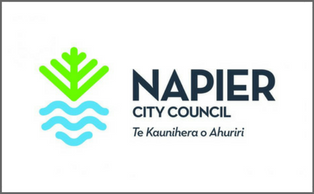 Art Deco Trust and the Napier City Council are both contributing to the fund, which will then be distributed in the following 12 months. The fund is to be used to assist with physical works for heritage buildings and at this stage, applications can be made only for minor restoration and painting work. Art Deco Trust has appointed a Heritage Working group, consisting of the following qualified people who will make recommendations to a smaller committee for final approval of heritage funds. 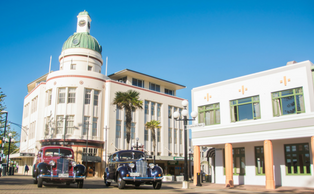 If you would like to make a donation* to the Robert McGregor Heritage Fund, either in memory of Robert or to further assist the work of the Trust to Preserve and Restore Art Deco Heritage in Hawke’s Bay then please follow the link below. 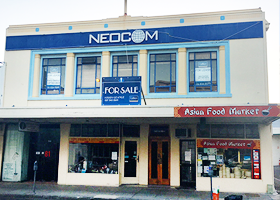 If you are an owner of an Art Deco era Heritage building in Napier and would like to view the criteria of the fund and further detail on how you can apply please follow the link below. Find criteria and further detail on how to apply to the Robert McGregor Heritage Fund here. 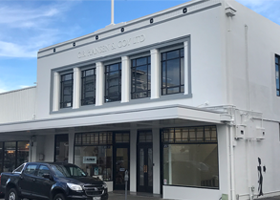 Two of Napier’s beautiful Art Deco buildings have become the first recipients of the Robert McGregor Heritage Fund in support of a spruce up of their facades. The Market Reserve Building is one of our most prominent heritage buildings and spans an entire block surrounded by Tennyson St, Hastings St, Emmerson St and Market St. Representative, Justine Walker from the body corp says “on behalf of the owners of the Criterion and Market Reserve buildings, I would like to applaud the Art Deco Heritage Committee in realising the value of these properties and the costs that go into preserving them. We are extremely privileged to have received a grant from the committee to help with some of the costs that were involved in our recent restoration and painting project”. The second recipient is the Hilderbrandts building, a 1933 Louis Hay design which is a favourite on the regular walking tours of the city because of its interesting facade. June 2018 marked the second round of the Robert McGregor Heritage Fund since its launch in November last year. We are delighted to announce and show off the four recipients of the June funding round. 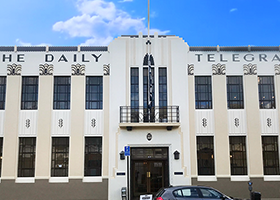 The Daily Telegraph Building is an iconic landmark on Tennyson street and it has been given new life thanks to a new coat of paint. The Canning and Loudoun building just down the road has also received some much needed TLC. The CB Hansen Building has had a major spruce up both inside and out. Finally the Sainsbury Logan building has received some support to help with some critical preservation work to their Art Deco skylight, a favourite feature for our visitors who get to view this building on our daily tours. The grants are gratefully received by all of our building owners. The fund is allowing us to build relationships and generate dialogue which will deliver significant wins for us as we continue to pursue our heritage mission. Three Napier buildings will receive funds from the Robert McGregor Heritage Fund in support of a spruce up of their facades. The former Bank of New South Wales (Crichton McKay & Haughton 1933) building on Hastings Street is receiving an overhaul inside and out with new owners bringing it back to its former glory. Owner, Carol Howard says “We are delighted to receive this grant which will assist with the painting of the façade, this will really bring together all the hard work completed over the past few months during the renovation and really bring the building back to life”. The second recipient is the CD Cox’s building on Dalton Street where owners Greg and Wendy Nowell Usticke are converting the spacious middle floors into 2 smart Art Deco Apartments. This is a labour of love for Greg and Wendy and the funding will assist with the façade painting back to its original colours. Finally, The Golden Crown building on Dickens Street is getting an overhaul by Wallace Development with a new restaurant tenanting the ground floor and a renovation of the first floor apartment and earthquake strengthening. Funds awarded will again assist the painting of the façade. You can find criteria and further detail on how to apply to Robert McGregor Heritage Fund here. Make a donation to support Robert McGregor Heritage Fund. 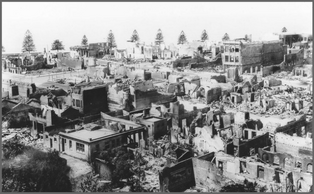 Robert McGregor Heritage Fund is supported by Napier City Council.